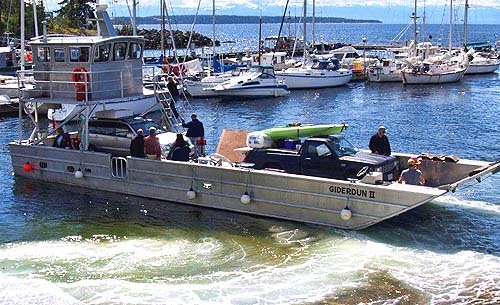 Lund Water Taxi provides service to Savary Island and surrounding areas year round. In the off season the schedule varies from day to day and is less frequent, please call to find out what we have already booked and to make a reservation. In the summer months, long weekends and holidays the water taxi fills up quickly so remember to reserve at least a week in advance to avoid dissappointment. Before you call us have a look at the B.C. Ferry Schedule so you have a good idea when you will arrive in Lund. Below is some information to frequently asked questions. Let Reservations know if you are travelling with bikes, pets or other large items. Pack and label your gear in sturdy waterproof containers. Thanks from the Lund Water Taxi Crew ! Commuter cards are available for $130.00 per card. This is 12 one way trips, so it saves you $1.00 per trip! As cards are discounted they must be paid for by cash or cheque. Savary Island Land Taxi rates range from $12.00 - $28.00 one way depending on where you are travelling on the island. Be sure to make reservations ahead of time. Baggage allowance is two medium sized totes or equivalent and one medium size duffle per full paying person. Anything above will incur a freight charge, to be determined at time of arrival. 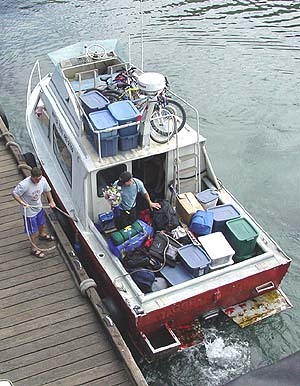 Building materials,batteries and fuel are NOT permitted on the watertaxi. Please let dispatcher know if you have extra gear at time of booking. Runs before 7:30 am are time and a half. We accept visa, mastercard, cash, cheque or debit card.